In all family activities. In fact, Laila is particularly gentle with children, showing an impressive maternal instinct. She's been progressing nicely in her foster home and we understand that she's housebroken, good on leash and is very polite about asking permission to hop up on the couch! Her sweet, playful nature is starting to come to the fore with her own kind too. Her social skills with other dogs are progressing just like we had hoped. 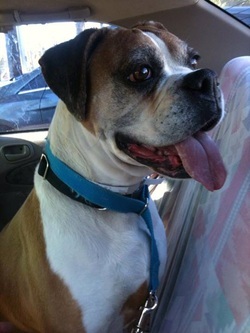 If a quintessential Boxer is what you're seeking, Laila is your girl!